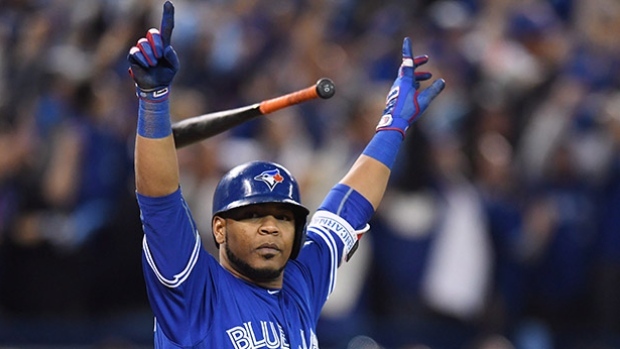 TORONTO - Edwin Encarnacion sauntered out of the Blue Jays' clubhouse, goggles on his forehead, his shirt drenched in champagne and clutching a bottle in his hand as he looked to share the moment with friends and family. Inside their locker-room, the jubilant Jays were spraying each other with booze in their second celebration in three days thanks to Encarnacion. The 33-year-old slugger added to his free agent price-tag with a three-run 11th-inning home run Tuesday that lifted Toronto to a 5-2 wild-card win over the Baltimore Orioles and set up an American League Division Series with the rival Texas Rangers for the second year in a row. Encarnacion's blast becomes part of Blue Jays lore, joining Joe Carter's three-run walk-off homer off Phillies closer Mitch Williams to win the 1993 World Series, and Jose Bautista's three-run shot, complete with bat-flip, against Texas in Game 5 of the 2015 ALDS. Devon Travis singled with one out off Ubaldo Jimenez, a starter who was Baltimore's seventh pitcher on the night, and moved to third on Josh Donaldson's single. Then Encarnacion went to work, depositing the ball over the left-field fence. "It was just a very special moment for us, and it was just nice to see the ball leave the ballpark," Encarnacion said though an interpreter. The first baseman threw his arms in the air, then let the bat drop and started to circle the bases - his right arm cocked for his trademark parrot celebration. He was greeted by a mass of teammates at home plate, including Ezequiel Carrera, who unbelievably had a plush parrot on his shoulder. The Jays outhit Baltimore 9-4 in a drama-filled game that lasted three hours 25 minutes. Toronto opens against Texas, the top seed in the American League, on Thursday in Arlington to open the five-game AL Division Series. The two teams have history from Bautista's homer to the brawl in May when Rangers second baseman Rougned Odor punched Bautista in the face after objecting to a slide. "I think whatever happened is in the past, it's all about winning now,'' Pillar said. After Stroman and Chris Tillman each gave up two runs, the two bullpens put on a show, putting up one zero after another. Surprisingly Baltimore did not use star closer Zach Britton. Manager Buck Showalter said Britton was available, he just opted to use others. Then, in extra innings, the managers turned to starters with Francisco Liriano (1-0) and Jimenez (0-1). By then, the sellout crowd of 49,934 was living and dying with every called strike and ball. Toronto led 1-0 on a Bautista homer in the second, trailed 2-1 in the fourth on Mark Trumbo's two-run shot and pulled even at 2-2 in the fifth on Carrera's RBI single. Then the pitchers went to work. The Jays sent in closer Roberto Osuna for the ninth. He needed 14 pitches to end it, striking out Trumbo and Matt Wieters as the decibel level grew. Toronto then had a glorious chance to end it in its half of the ninth. Donaldson doubled off Brad Brach down the left field line to open the inning. Encarnacion was intentionally walked, bringing up Bautista who struck out. Darren O'Day needed just one pitch to induce Russell Martin to hit into the Jays' third double play of the night. Osuna got one out in the 10th then left quickly with an apparent injury, bringing out Liriano who got the two remaining outs. Osuna later said he felt a "stretch'' in his pitching shoulder, But doctors told him nothing appeared wrong and he expected to be ready Friday for Game 2. Bautista had a solo homer in the second inning for Toronto, which got six strong innings from Stroman and some great defence from Pillar, Troy Tulowitzki and Donaldson before a loud, passionate crowd under the stars at the Rogers Centre. "Both teams played so well,'' said Toronto manager John Gibbons. "Both teams deserved to win that game. I said many times, there's something to having that last at-bat. That's why you love the chance to play at home. Stroman retired the first nine hitters he faced but stumbled in the fourth when Trumbo, who led the majors with 47 home runs this season, hit a two-run shot to left. Stroman was good but so was Tillman, who only allowed Bautista to reach base until he ran into trouble in the fifth. Michael Saunders hit a swerving ground-rule double to left with one out and Pillar then doubled to right field on a play Michael Bourn looked to have but missed at the last second after a long run. That left men on second and third, with Saunders coming home on Carrera's short single to centre. Tillman gave way to Mychal Givens, who got Travis to hit into a double play. There was a nasty moment in the seventh when Baltimore left fielder Hyun Soo Kim was almost hit by a beer can thrown from the stands he made a catch near the fence. The wild-card race went down to the last day of the regular season with Toronto having to throw ace Aaron Sanchez into action Sunday in Boston. He did his job but as a result the Jays, who went 13-16 in an up-and-down September, were denied their top pitcher in the one-game wild-card showdown. The atmosphere was electric on a 17-degree Celsius October night. "Let's go BlueJays! Canadians are behind you," tweeted Prime Minister Justin Trudeau. For a city caught up in Jays fever, it was more than a playoff game. A loss and it was possibly the end of an era with Bautista and Encarnacion facing free agency. Baltimore didn't get a runner on base until Adam Jones singled to right to open the fourth. With Jones running on a full count, the Orioles avoided a double play as Kim grounded out to first. Pillar then made a highlight-reel diving catch after a long run to dispatch Manny Machado. The crowd was silenced when Trumbo, the next batter, slammed a two-run shot to left. Stroman gave up two runs on four hits with no walks and six strikeouts in his six innings. He threw 81 pitches, of which 53 were strikes. Tuesday marked the 20th time the Baltimore and Toronto had met this season with the Jays holding 10-9 edge coming into the game. Both clubs finished with the same 89-73 record in the regular season. We were in the Regina airport recently and could not believe how many fans wearing blue jays gear were getting onto the Toronto bound plane. I did not realize how popular Blue Jays baseball was in Saskatchewan! No, no they aren't. They are the Toronto Blue Jays, not the Canada Blue Jays. That whole Canada's team is media driven. Uh, Team Canada is Canada's team. Ya, 49,000 fans all touched the can, then passed it to the guy who threw it. Video shows it was a woman that threw the can, not only one time, but once again on the winning 3-run walkoff. Time for that poor guy to hire an ambulance chaser and sue Toronto Star and CTV. I was there, that's exactly what happened lol. The only people in Canada that care about the CFL live in Regina.